You will have to take what you can get, or make them yourself using wood. 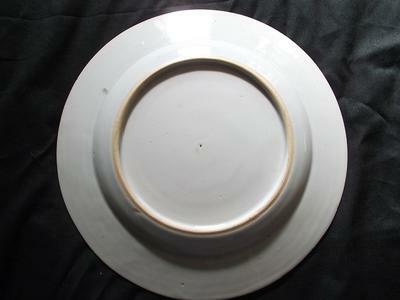 Size depends on the plate and better do not use too small ones if a plate seems shaky. I use some acrylic ones because they are transparent, but there are many types. If the stand size and proportions is right a plate will not easily fall. The pictures are a bit small and there are onlz details of one. I assume the bottom is of that one? No, never seen this type of decoration before. 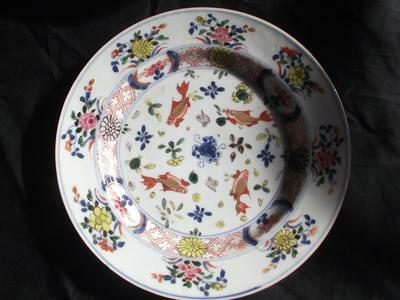 Looks like a mix of Imari and other fencai decoration. That thing in the middle is just a floral decoration, I think. Around Yongzheng to Qianlong, perhaps. 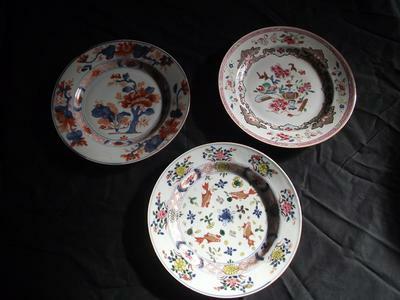 Just from the single small picture the decoration of the left top plate looks like a more regular Imari plate with floral/garden decoration. 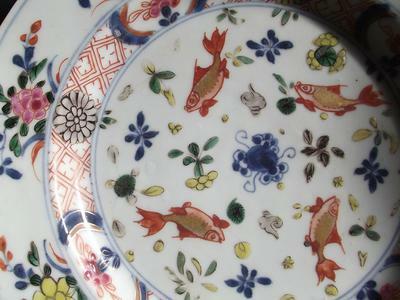 If the other bottoms are also 18th century it would be earlier, perhaps Kangxi reign. The one on the right would be perhaps Yongzheng to Qianlong reign, judging by this picture. All of them 18th century, three reigns period (Kangxi, Yongzheng, Qianlong), however more exact dating is difficult.